In word, sound and sight, Messian Dread share his knowledge and insight when it comes to, well, making Dub with computers. En passant you'll learn a formula to make your own Reggae songs and get in-depth information on why the music is what it is. You will find sound examples, video's, screenshots and even samples and (free) downloads unlisted anywhere else on this site, including the download section right here at Studio Dubroom. The tutorial is not aimed at any specific DAW but it does have some extra's for Reason users. 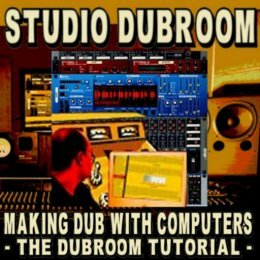 This tutorial is in an unfinished stage, but it does contain the basics to get yourself equipped to use just about any DAW or even hardware studio in order to make DUB from Reggae Music in the authentic and original way. When you have a question or comment you'd like to see addressed, feel free to use the Dubroom Contact pages or join YUKU.com and post your words publicly on the Studio Forum. Click here to read about the latest updates to this tutorial. In this in-depth tutorial with lots of pictures, online artist BLAMINACK shows how to build an original hand drum. Time to record a real guitar or bass and bring some life to your songs. In theses tips and technical advises we'll see how to do it so you could achieve the best recording takes in an HOMESTUDIO for the low cost as possible.